Map view: Marker clustering size misleading? Hi - I used Map view (markers clustered and sized by number of records) to map some data. As you can see the size of clusters doesn't reflect the number of records within clusters. There are many clusters which have a significant difference in terms of number of records but the size of them is still the same e.g. clusters with number of records =2 have same size as clusters with number of records >4000? Are there any options to adjust the size of the clusters to the number of records? Darius - In the Map View toolbar, there is a Marker dropdown menu to control record marker behaviour in that view. If you have Marker placement set to clustered, the default is a fixed size (and not proportional), but there are options to control the range (distance determining clusters) and the strength of the sizing (from Min to Max). 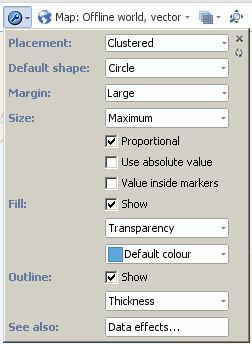 There is also the tick-box option to switch Sizing behavior to Proportional sizing. I can see the options controlling the distance between clusters and the strength of the sizing but I cannot find the tick-box option to switch proportional sizing. Could you direct me to this option, please? I attached a pic of the options I have. I went to 2.8 because there were problems in 2.7. If I move to 2.7 now it will bring all the problems back. Could you add it to the latest 2.8 version please? I am sorry but you are wrong. 2.8 and 2.7 menu doesn't look the same. Please take a closer look at my snap shot ABOVE and you will see that there is no option to tick "Proportional". Make sure you have the latest version of 2.8 and try changing the Size setting...the proportional tick box option should appear on the menu? The options look exactly the same as on the picture attached to my previous message. It looks like there is no such option as "Proportional" to tick. Darius - There may be something in the history of your file's configuration that is stopping the 'Proportional' option (which is contextual) from displaying...can you send us the file to the support mailbox please?